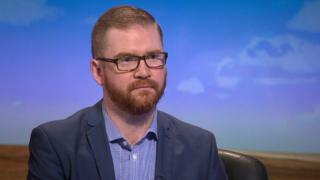 Former Economy Minister Simon Hamilton has "serious questions" to answer about his role in the Commonwealth Youth Games bid, the Alliance Party has said. Belfast is due to host the games in 2021 and was to take part in a traditional games handover to the city at the 2017 closing ceremony. However, it was announced on Tuesday that Belfast would not be taking part in the ceremony. The DUP said there were "inadequacies" in the games' business case. In a statement, the party said that Department for the Economy officials "were unable to recommend approval" to Mr Hamilton, the then minister. The DUP statement also said it could not progress the bid as Sinn Féin had collapsed the Northern Ireland Executive in January. Last month, Conal Heatley of the Commonwealth Games Council said the "value for money" argument was a "red herring". "Sport has been disenfranchised. As sport events sit within the Department of the Economy, it means if we wanted to bring a world championship in a minority sport to Northern Ireland, we've no chance because it's going to be judged on bed nights and pounds, shillings and pence. "It's about our international reputation; it's about empowering young people; it's about participation in sport; it's about social cohesion; it's all of those things." The president of the Commonwealth Games Federation was in Belfast last month for crisis talks and had hoped that money would be released in time for Belfast to take part in the closing ceremony. It may still be possible for Belfast to host the Games in 2021 and organisers hope the bid can be saved. However, Alliance Party MLA Chris Lyttle said it was a "disgrace" that Northern Ireland would miss out on the official handover. He said the DUP's Mr Hamilton must face questions about "when he was in receipt of the outcome of the business case" for the Games and why any potential issues were not passed on to the executive. He said he had facilitated meetings between the Northern Ireland Commonwealth Games Council and the head of the civil service to find a solution to the funding issues. "Regrettably, ministerial authority was still needed to deliver on the clear support," Mr Lyttle added. "It is unacceptable this situation has been allowed to develop - the young athletes deserve an explanation as to why from former minister Hamilton." The Ulster Unionist MLA Alan Chambers said the situation is "an embarrassment". "As a result of Sinn Féin collapsing the assembly, this was not possible. "If the Alliance Party are now so concerned about the funding for this event perhaps they shouldn't have indulged and encouraged Sinn Féin in its antics earlier this year." Sinn Féin has blamed the collapse of Stormont on both the DUP and the government. The Chairman of the Northern Ireland Commonwealth Games Council, Robert McVeigh, said: "It's pretty embarrassing for Northern Ireland not to be in a position to receive the quaich at the closing ceremony. A quaich, from the Gaelic 'cuach' is a shallow, one or two-handed wooden bowls traditionally used in Scotland from the 17th Century as drinking cups. Now Scottish quaichs are most commonly made from silver and handed out as competition prizes or gifts. Fishermen also use them to toast the opening of the new salmon season every year by tipping whisky from the quaich into the river. They have come to symbolise love and friendship and were used at the 2014 Commonwealth Games in Glasgow to promote that message. "We have to take the embarrassment of not having the quaich handed over to us," he said. However, he said that Northern Ireland's young athletes and their coaches at the Commonwealth Games would be focusing on performing as best as they possibly can. "We were asked to bid for the games by the assembly and we went out and won the bid, it was clear to all the political parties the costs that there were going to be for the games and business cases were submitted. "In order to get the money released, it has to have ministerial sign-off, and there are simply no ministers in place," he said. Mr McVeigh refused to criticised former economy minister Simon Hamilton however and added that he remains confident that Northern Ireland will host the 2021 Commonwealth Youth Games. About 1,000 young athletes are due to take part in the Games and it would be a landmark event for Northern Ireland's centenary year. Sports stars like Carl Frampton, Michael Conlon, Jessica Ennis Hill, Beth Tweddle and Louis Smith have all taken part in previous events. The hosting rights were awarded to Northern Ireland in February 2016. A spokesperson for the Department for the Economy said: "Officials have been unable to commit to funding this event as, despite the best efforts of all involved, it has not been possible to approve the business case because it does not demonstrate value for money."